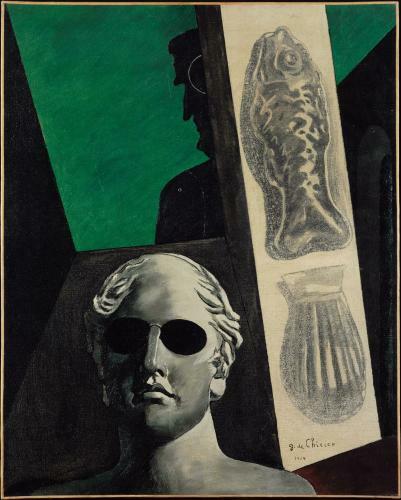 Giorgio De Chirico arrived in Paris in 1911 and two years later joined the circle around Apollinaire. As early as 1913, the poet admired the painter’s work, championing it in several articles. Aware of Apollinaire’s contribution to his success, De Chirico offered him in tribute this portrait with its Orphic attributes. Apollinaire decided to use the image as the frontispiece for LEt moi aussi je suis peintre, his first collection of calligrams, published in 1914. A “premonitory” target on the temple of the shadow-figure representing the poet indicates the spot where he would be struck by a shell-fragment in 1916.